Figure 2. Population doubling potential of pre-stasis HMEC in different media. Primary cultures from reduction mammoplasty specimen 184 were initiated from organoids in different media. The number of PD in primary culture cannot be accurately determined; growth is shown starting from passage 2. All proliferation stopped in HMEC grown in serum containing media (MM and M87A with oxytocin (X)) after 10-50 PD beyond passage 2. The extensive proliferative potential in M87A+X supports generation of large batches of early passage pre-stasis HMEC from individual donors. HMEC initiated in serum-free MCDB 170 (commercial MEGM) show rapid induction of p16 and cessation of growth. 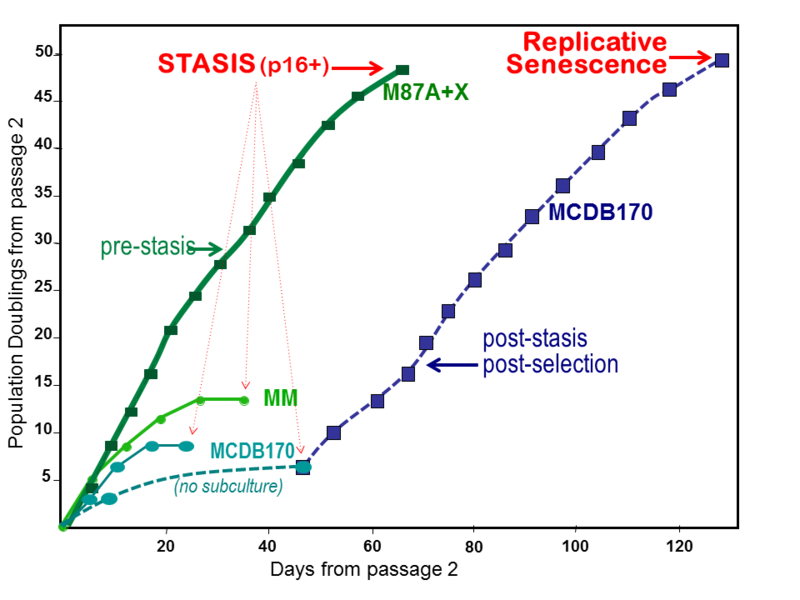 When cultures are allowed to sit without subculture for 2-3 weeks, post-selection post-stasis HMEC emerge and maintain growth to replicative senescence. If cultures are repeatedly subcultured, fewer to no post-selection cells may emerge.